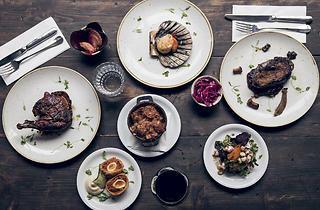 A Scandinavian restaurant specialising in smoked dishes and locally sourced British ingredients. You know when the weather’s so dire that before leaving the house you mutter ‘This had better be worth it’? Well, our review of Rök fell on just such an evening and we squelched into this Shoreditch smokehouse with a murderous need for a cocktail. Less than five minutes in, the weather outside was forgotten. The narrow, low-lit dining room was filled with pristinely groomed thirtysomethings, not a beard hair out of place. The design nods to Nordic chic, with white walls, dark-wood tables, a small open kitchen with a custom-made charcoal grill, and jars of homemade pickles adorning the bar. There are just three cocktails – all special. An amaretto sour turbocharged with bourbon and pistachio liqueur was a smooth, creamy treat, while a coupette of herbal Chartreuse and tart rhubarb was perfectly balanced. 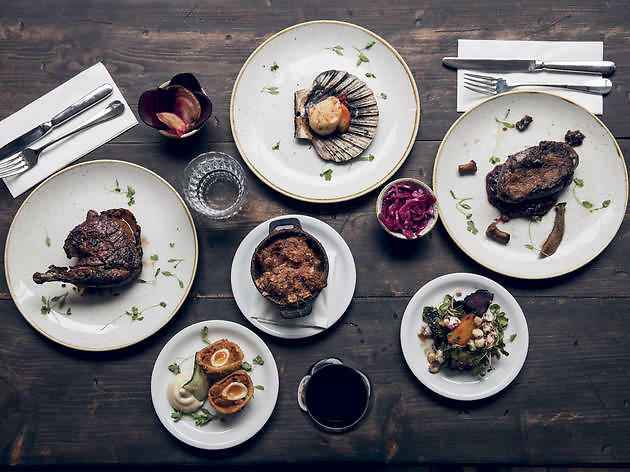 The food, with its powerfully flavoured meat cures, pickles and jams, is also vaguely Nordic in style, but centres on British produce, with the odd wild-card southern European ingredient. A single scallop, sizzling in the chilli-hot oil from Italian ’nduja sausage was bursting with fiery, sense-sharpening flavours – we could have gobbled up another 20. A pot of juicy mussels steamed in east-London wheat beer (‘It’s cockney marinière,’ joked our waiter) showed masterly layering of flavour. Although we expected the meat – including two huge fennel-cured lamb chops, cooked sous-vide then finished over the coals – to be the star of the main courses, sides were equally impressive, especially a salad of smoky charred broccoli with nuts, seeds and quinoa in a perky citrus dressing. Rök had only been operating for a week on our visit, but staff had mastered the knack of communicating dish details in a non-robotic way. Our only bugbear was the teeny size of the tables for two – but even they’re likely to be hot tickets soon. Rök? Totally worth it, rain or shine. 5pm – 11pm Mon - Thurs; 5pm-1am Fri - Sat. I honestly can’t rate this place enough. Tucked away on Curtain Road in a row of just three buildings left standing after everything else was demolished – it looks just like the scene from Up – the restaurant is wonderful. It’s very small and the décor sticks to Scandinavian influences with a lovely smoky smell. All the food is cooked/smoked at the back of the restaurant and I’d high recommend sitting with your back to the door so you can watch the flames. This is one of those restaurants where you want to try everything and I mean everything so it’s definitely worth ordering everything you want to try and share it between you. It was recommended to order a main each but we just ordered one to share, two sides – highly recommend the Blackened cabbage and the fennel pickle and of course the star of the show, the scallop. It is probably not the place to come is you’re incredible hungry as the portions are small and aren’t cheap but one main, sides and a starter was more than enough for us. I’ll be back for sure! Incredible food and attentive staff with great knowledge of produce on the menu. Highly recommend! Rok is absolutely one of the revelations of this year. The Hoxton venue serves the best that Scandinavia has to offer. From pickled cucumber and carrots as pre-dinner nibbles to the smoked duck breast, every dish on the menu is surprising, delicious, flavourful, and quite often smoked. The bare interior may put you off and it is not one of the most comfortable restaurants but the food is such an experience that you will want to look past all that. Rok only opened recently, but is already packed every night. We arrived at 9.50 for our 10.00 reservation and our table was still waiting to clear. We were offered a seat at the bar while we waited and ordered a couple of delicious Hoxton Negronis (the addition of grapefruit bitters works really well). Sebastian behind the bar was very welcoming. We like sitting at bars as a general rule so asked if we could just eat there - this was greeted enthusiastically and worked for everyone! On to the food. Rok is a Nordic smokehouse, but that's misleading - smoke is used to heighten flavours rather than over power as so often happens, so while all the dishes have some smokiness, it tends to be very subtle, like an extra welcome ingredient. We were told that the cauliflower cheese with grated braesola and the ribeye had run out (more on that later), so ordered pickled cucumber, pickled wild mushrooms, scallops with samphire and nduja oil, a quail scotch egg (also made with nduja), duck with loganberry, guinea fowl, with sides of bone marrow mash and a beet salad. While finishing our starters, we were told that there was actually one ribeye left if we wanted to swap, which we did for the guinea fowl. Catherine, who looked after U.S., couldn't have been more helpful, and actually brought the guinea fowl as well on the house. All the food is sensational, flavours, enhanced by the smoking, are like your perfect comfort food taken to the next level. The duck was probably the stand out dish for us, but I'd happily eat everything again. There's a very short wine list and we had a lovely rich Puglia which complemented the flavours perfectly. Total for all the above, including cocktails, was £116 including service, which is fantastic value for cooking of this quality. Maybe it's our tastes and preference for less formal eating, but I'd much rather eat the food here than the much-lauded Clove Club down the road. Looks like we've found our new neighbourhood favourite! How much l say Scandinavian? I had arranged dinner for two at Rök last night.small restaurant with impeccable service. Bring me back a good home-cook-meal in Tapas style. Pistachio cocktail. beyond! At the end of the night.I was lingering and l wanted to put my arms around these guys. We had a lovely night. We'll come back. I went to the Rök Smokehouse for dinner last Monday and I thought it would be really busy, but it was quite quiet. the prices are a little high but if you're careful with what you order you can get away with spending about £20. The staff is very engaging, especially the waitress which brings out the food; giving a full description of what is on the dish. I particularly liked that they seated us a t a table for four even if there was only two of us, making more room for various dishes. Their menu supposedly changes quite often, which makes the place a bit more dynamic and interesting. If you want a little bit of something gourmet at a fair price, its worth the visit. Last night I went with a group of friends to the new restaurant Rök Smokehouse and Bar in Shoreditch. The local is very small and has a life kitchen at the end of the dinning-room. I’ve tried the nduja scotch quail egg with dijon mayonnaise. The combination of flavours was very unusual. Maybe because I’m the mayonnaise number one fan. The cobble lane charcuterie with toasted sourdough and pickles was just perfect. Last came the pork with granny smith and the guinea fowl with the cauliflower cheese and the bone marrow mash. The meat was very tender but I felt that the portion could be a little bit bigger. For dessert I had the wood roasted peach with crème fraiche, honey and almond. Definitely, the best choice of the night. The food, although tasty, is very pretentious and overpriced, this wasn't helped by bad service. I visited Rök during the soft opening, so I’m sure they are yet to fully bloom as a few things didn’t work. But the food! The food makes you forget the mishaps. Coming from central Europe, I love pickles, so I was really looking forward to this part of the menu with great anticipation, and I must say they rock! The delicate sweet wild mushrooms with thyme pickle were served in a cute jar and were divine. I tried the mussels cooked in beer served with sour dough bread which were delicious. They were very tender and I loved the broth. The charred broccoli salad with quinoa, pumpkin seed, toasted almonds, garlic and sesame seeds was great too. The combination of flavours was completely new to me. I’m pescatarian, so I won’t be able to say much about their main thing, which is the meat, but my partner loved the pork belly. The only thing he was complaining about was the fact that portion size was a touch too big for such a rich and fatty dish. The roasted apple served with the pork was perfect. But I can tell you, go for the veggies! They were beautiful. The burned sweet potatoes, with horseradish vinaigrette were full of flavours and the horseradish sauce was creamy, not too strong, just perfect. On the downside, the waiting time was beyond acceptable. In the first 55 minutes we only got one dish out of 7 we ordered. There was only one chef trying to make everyone happy and not everything we ordered was available, which we were only told about after 1.5h. Rok lives up to its name as a smoke house to a slightly uncomfortable extent. The kitchen is open and the ventilation needs improvement.